The finish is usually the last thing that you do when building a piece of furniture, but it is the first thing that someone sees when looking at your work. You can do a great job designing and building a piece of furniture, but if the finish is of poor quality it will devalue the entire piece. Finishes can be divided into two main categories: air oxidizing finishes and solvent release finishes. Air oxidizing finishes cure by reacting with oxygen and this category includes oils, varnishes, and urethanes. 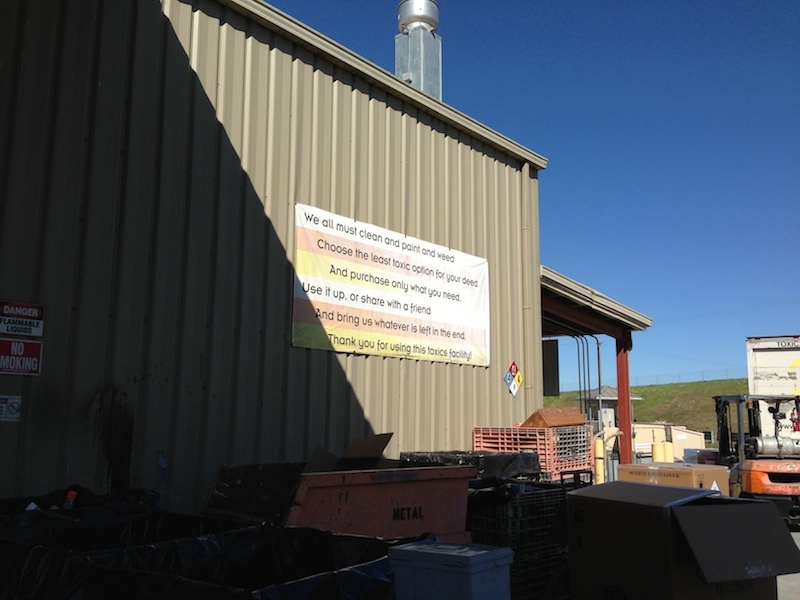 Solvent release finishes cure when the solvents evaporate into the air, leaving a layer of resin on the surface. 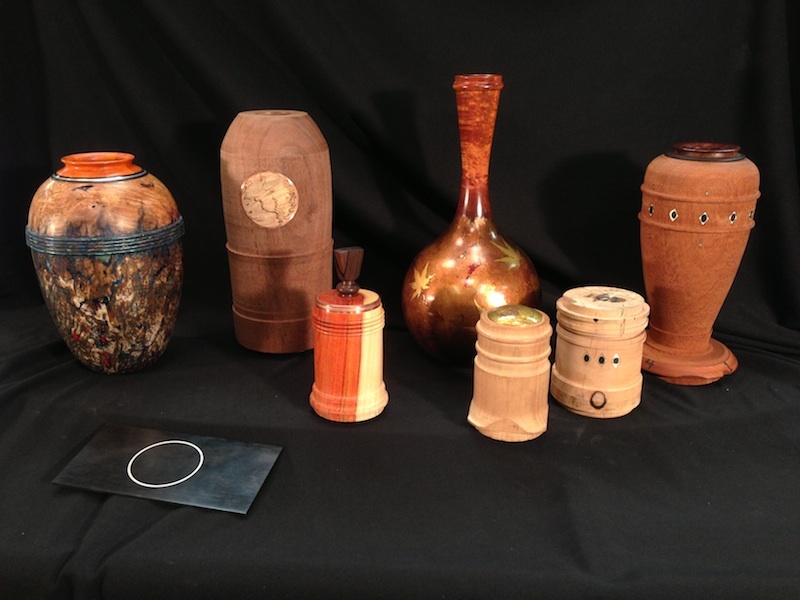 Finishes in this category include shellac, lacquer, and some water based finishes. No matter which type of finish you select, keep in mind that approximately 60% to 70% of a good finish is surface preparation. That means scraping and sanding until all saw marks, mill marks, etc, are removed. 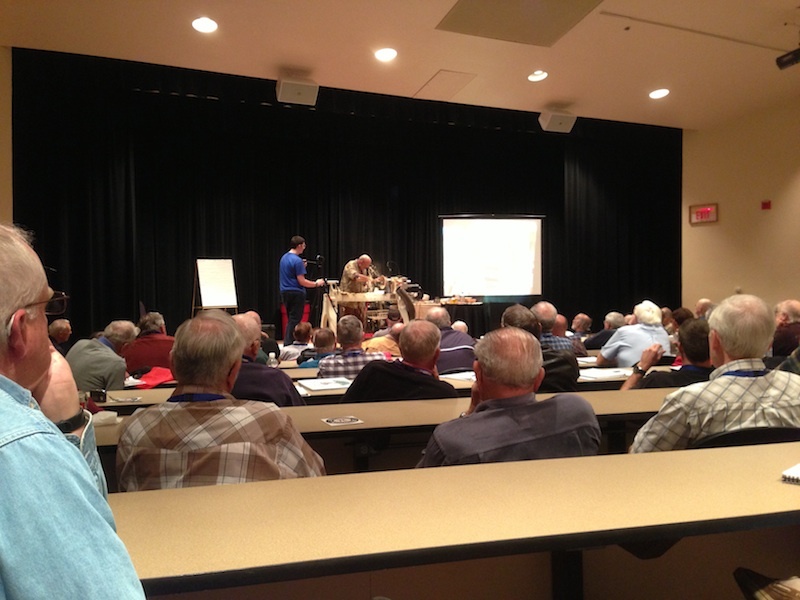 Tabletops are the most critical and need to be examined in raking light. That means placing a light source near the table and positioning yourself so that you can see the light reflect off the top. As you move around, your eyes should be able to scrutinize every square inch of the top, revealing any scratches, flaws, high spots, or low spots. Generally speaking, I prefer a hand rubbed oil finish for most of the furniture that I build. Linseed oil and Tung oil are the two most commonly used oils in finishes and both of them have withstood the test of time. Linseed oil is derived from the flax plant and has been used since the ancient Egyptians. Tung oil is derived from the nuts of the Tung tree which grows in the Far East and was used to help preserve the Great Wall of China. Both of these oils penetrate the structure of wood cells creating a finish that is “in” the wood as opposed to being “on” the wood. Applying multiple thin coats will create depth and accentuate the figure of the wood. 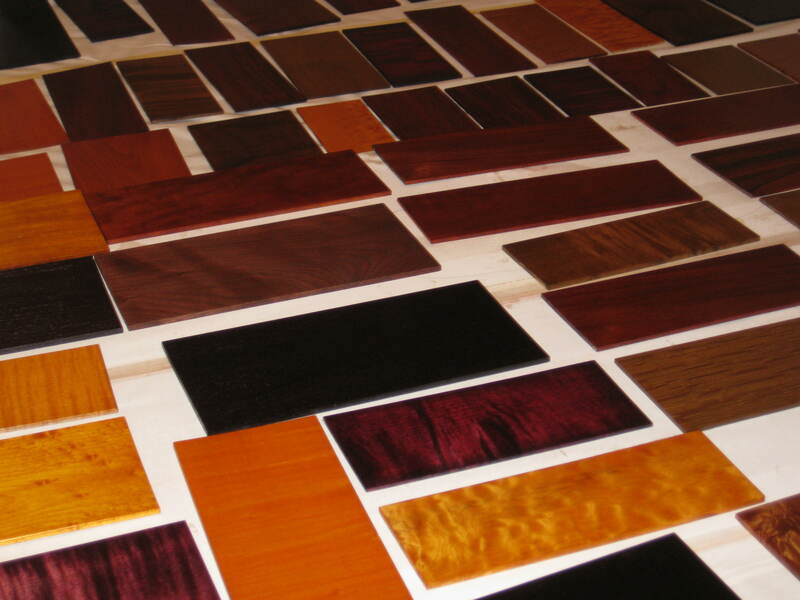 Oil finishes do not offer the same resistance to moisture that film finishes like lacquer and polyurethane do, but the trade off is that they allow for a very natural looking finish and permit you to experience the tactile quality of the wood. In addition, they are easy to repair. If the surface looks worn, you do not have to strip it and sand it; you simply rub in another coat of oil. I have also found that they can be enhanced by lightly rubbing with 0000 steel wool and applying a light coat of wax. 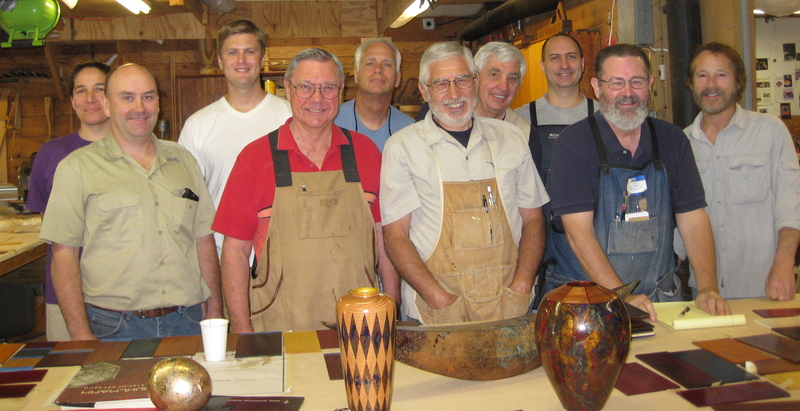 I will be teaching a 5 days hands on class on Finishing in my Workshop/Studio here in Santa Rosa, California on August 1 – 5, 2013. 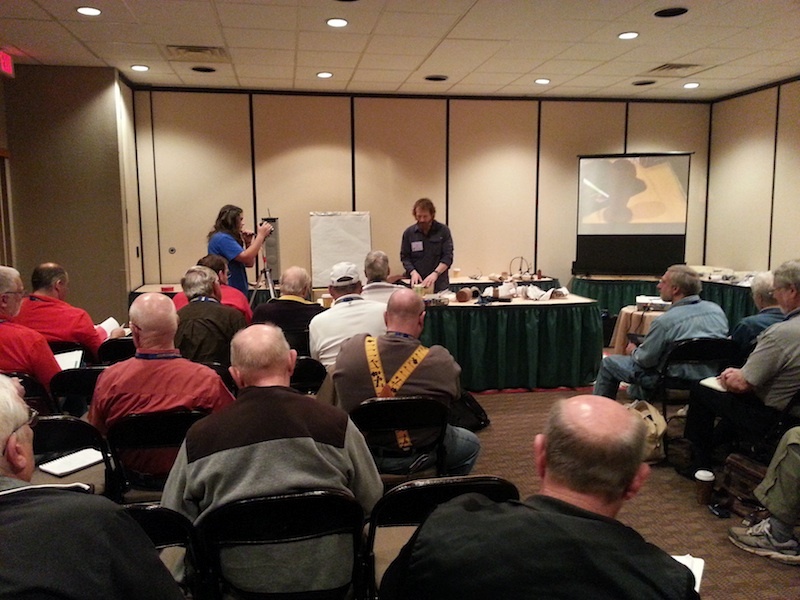 Finishes that I will cover in the class include: shellac, various oils, as well as lacquers and polyurethanes. For those that have seen Woodworks, I will cover in depth my technique for applying hand rubbed oil finishes which are also known as wiping varnishes. Here is the link to the Classes Section of my website that gives the class description and registration information. 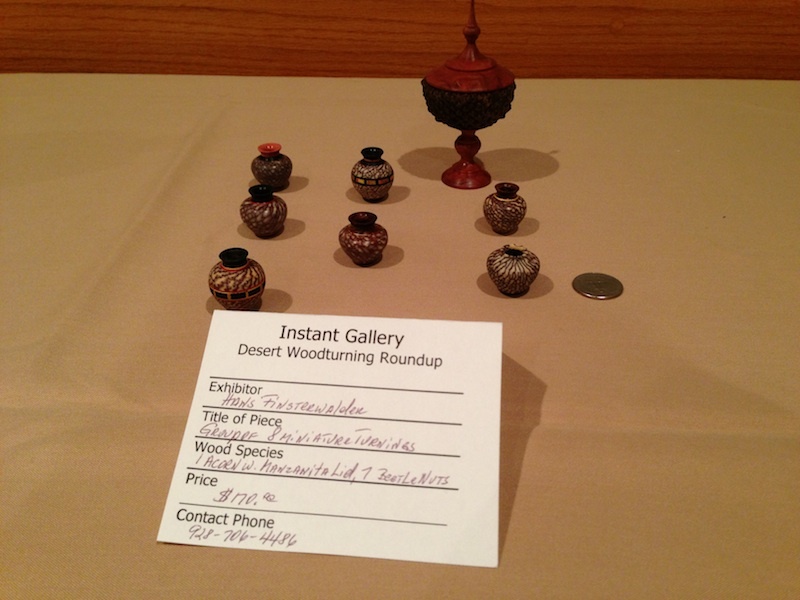 Last weekend I demonstrated at the Desert Woodturning Roundup in Mesa, Arizona. 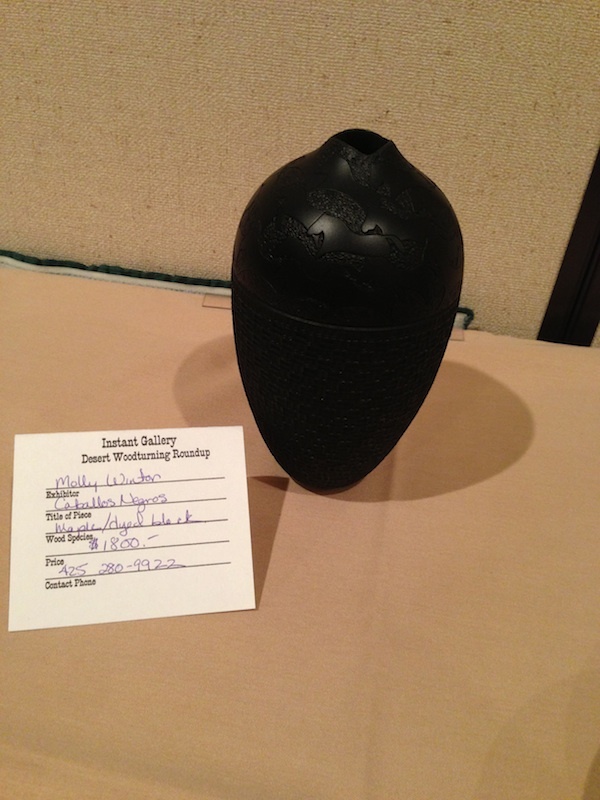 I had 6 rotations, 2 on combining metal with wood, 2 on gilding turned vessels and 2 on creating patinas on vessels. 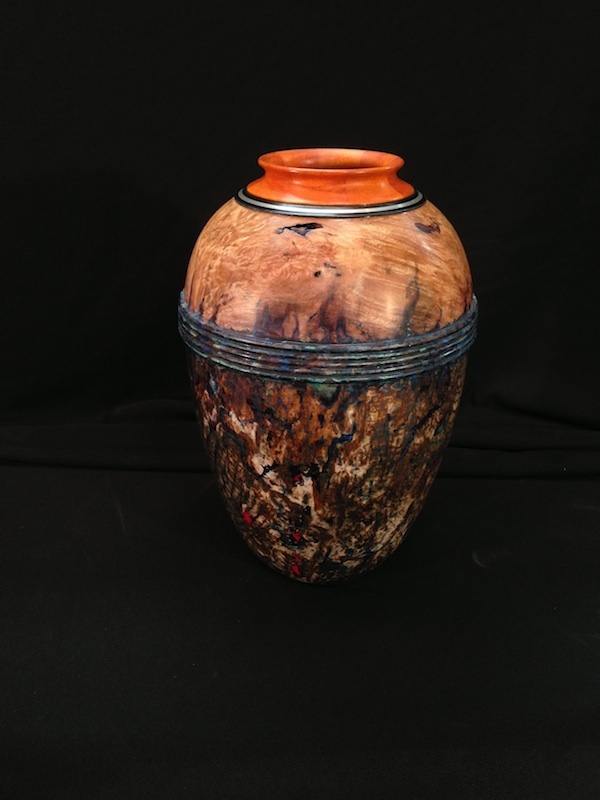 “Desert Urn” is the title of this 81/2″ tall x 51/2″ diameter hollow vessel I turned. 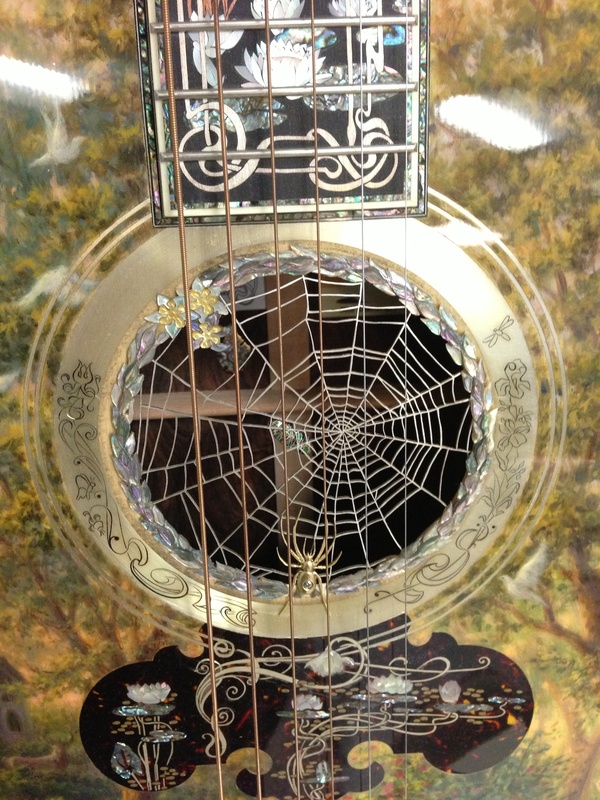 It combines silver inlay into the pernambuco and ebony rim at the top. I gilded the lower body of the vessel with silver leaf and did a patina finish over it. 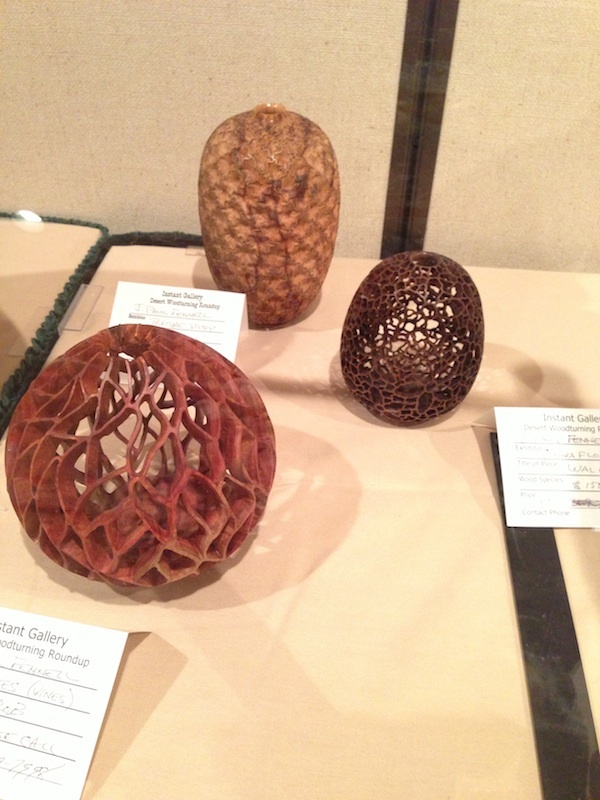 J. Paul Fennel who lives in Scottsdale and does some amazing pierced and carved hollow vessels. Richard Raffan from Australia who is one of the best known turners in the world with several books and videos that have won critical acclaim. Molly Winton who has earned her fine reputation for her surface embellishments of wood burning, carving, texturing, and coloring. 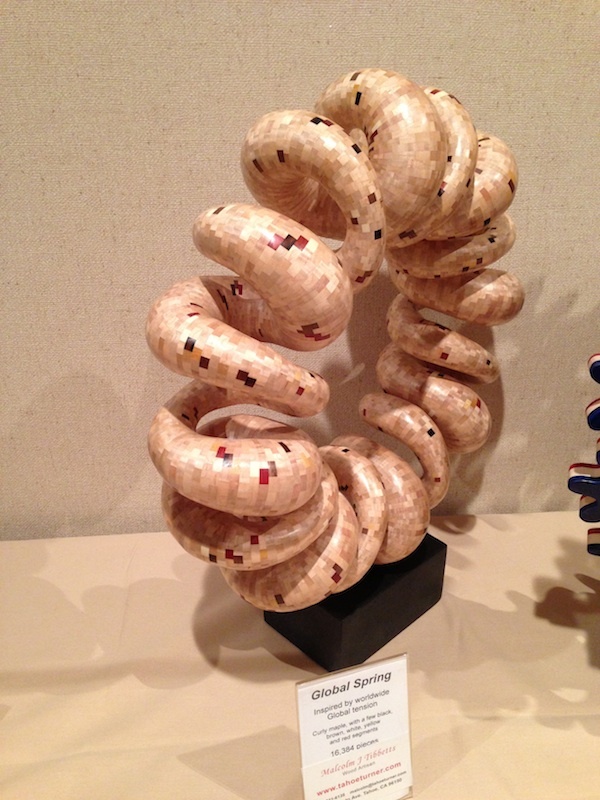 Malcolm Tibbetts famous for his incredible segmented turnings that boggle the imagination and his book and numerous DVDs on the subject. Michael Hosaluk who is a member of Canada’s Royal Canadian Academy of Arts and is well known world wide for his incredible creativity not to mention turned and burned baseballs. Matt Monaco, a production turner (and fellow drummer) who lives in Arizona whose work is influenced by Mexican, Southwestern, and African cultures. 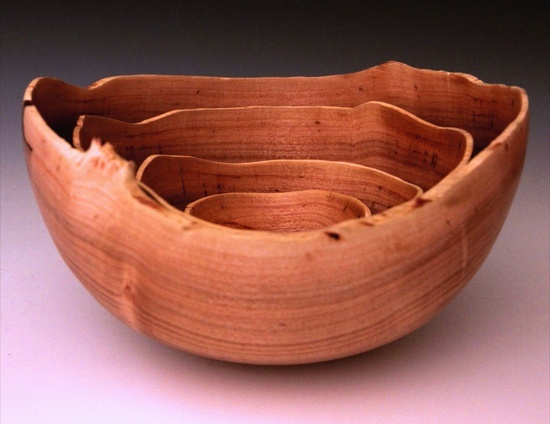 John Lucas from Tennessee, who is well known for his turned hand mirrors, sculptural turnings, articles on wood turning, and photography. 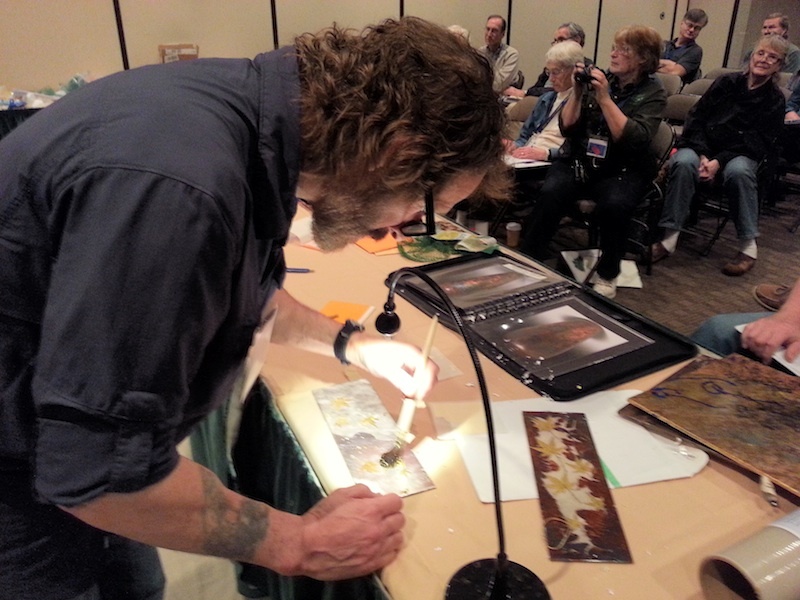 Here are some photos of the work I demonstrated. 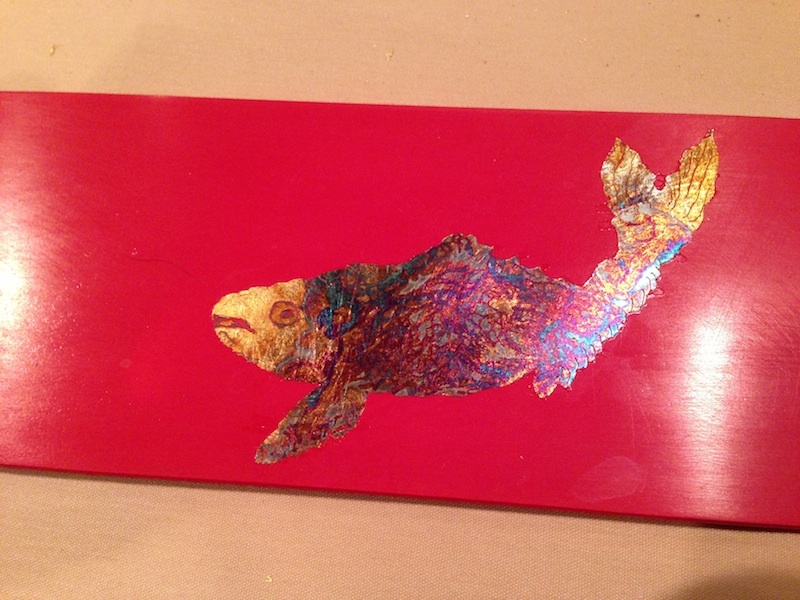 Demo sample of gilded fish. Silver leaf with chemical patina. 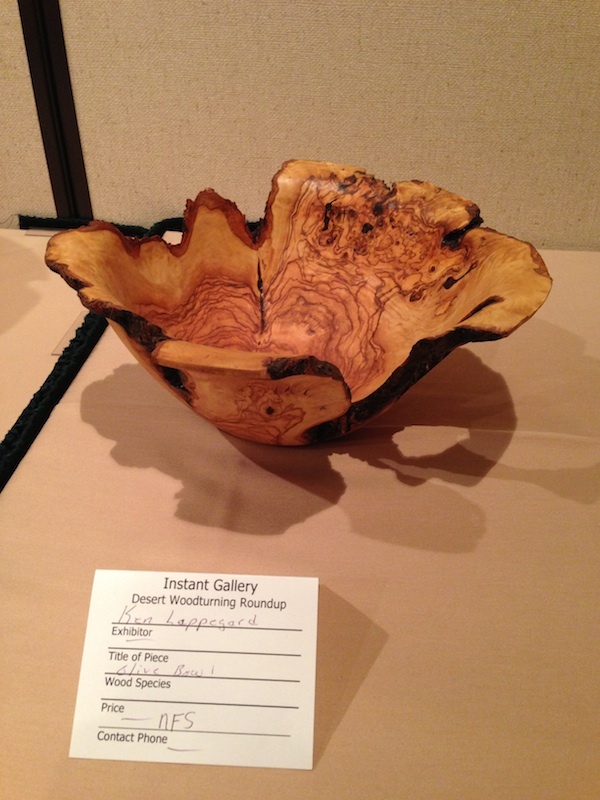 The instant Gallery had numerous works of art with a wide range of talent. Malcolm Tibbetts and I were asked to be available to give critiques to those who wanted them in the Instant Gallery. 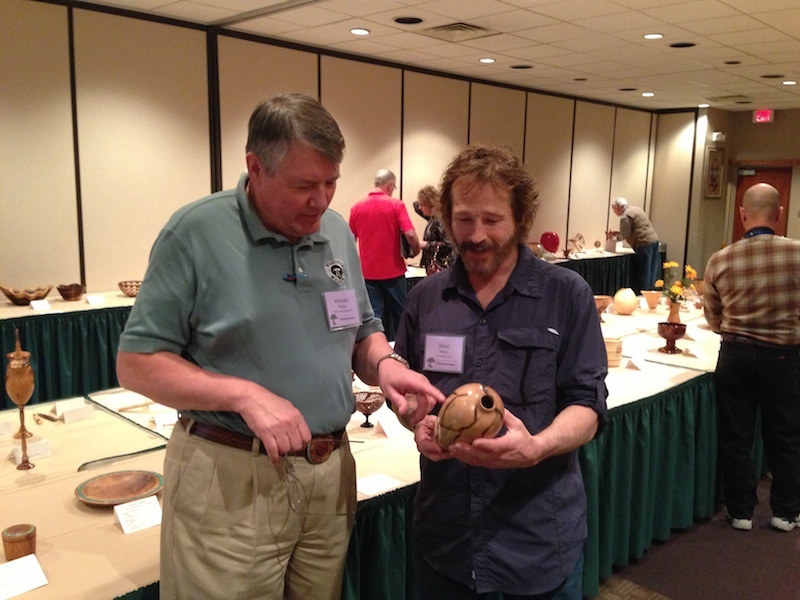 I want to personally thank Dale Gillaspy and the entire crew of volunteers from the Arizona Woodturners Association who worked really hard and did an excellent job of organizing this event. 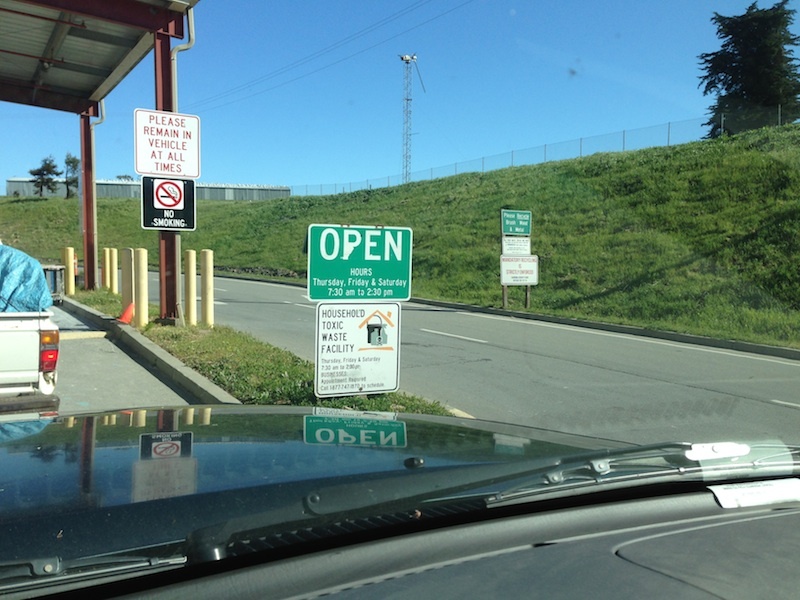 I had a student in mid November 2012 that traveled from North Carolina to take a 5 day private class with me. One of the things she was interested in learning was my method of cutting dovetails using the bandsaw and getting that “hand cut” look. 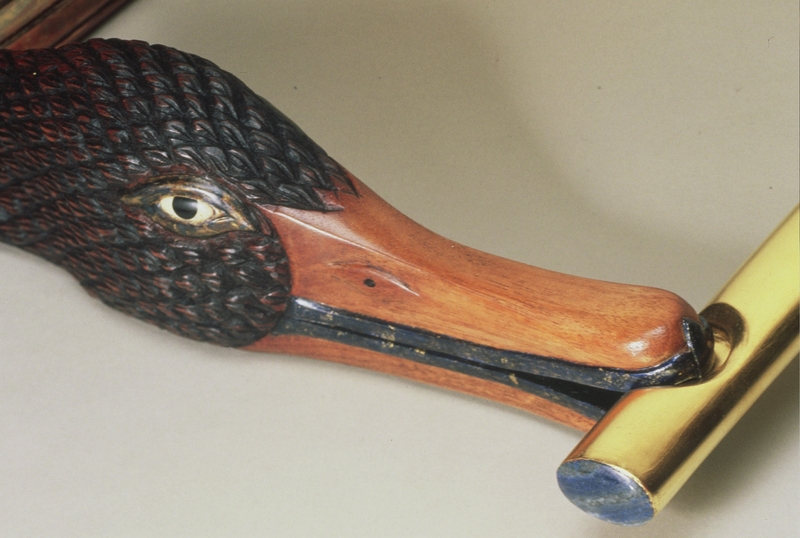 She had been taught by a Master Craftsman from the UK to use a dovetail saw. She loves hand tools and is very good with them, especially hand planes. The challenge for her was that due to some recent medical issues, she was experiencing difficulties holding the dovetail saw straight all the way through the cut. I her told that I have had carpel tunnel surgery and two other hand surgeries related to tendon pain and I prefer to use the bandsaw to cut dovetails. I use a method of cutting the pins first, if you are cutting by hand with a dovetail saw, then it makes sense to cut the tails first. She was quite pleasently surprised when I demonstrated that by tilting the table of the bandsaw 8 degrees in one direction, and set the fence to the appropriate spacing, that we could cut the pins with very straight lines. Once those cuts were made, we tilted the bandsaw table to 8 degrees in the opposite direction and made the other set of cuts on the pins, again moving the fence to each layout line. After that we used the fretsaw to cut out the bulk of the waste, clamped a guide block across the scribe line, chiseled half way down, flipped the stock and then did the same procedure on the opposite side. I like to clamp the guide block onto the tails board to ensure accuracy in relationship to the scribe line. Next I clamp the pins board to the guide block lined up with the edges of the tails board and scribe the outline of the pins onto the tails board. This gives us the cut line. After the tails are cut and pared with some dovetail chisels,then we do a test fit, pare a little more until we are ready for the glue up. 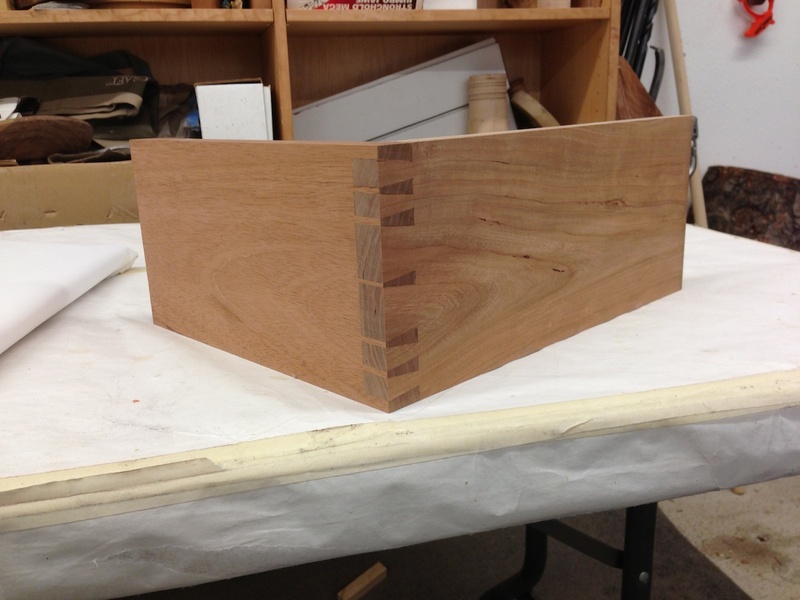 Here is a photo of her completed dovetail sample cut in cherry wood. 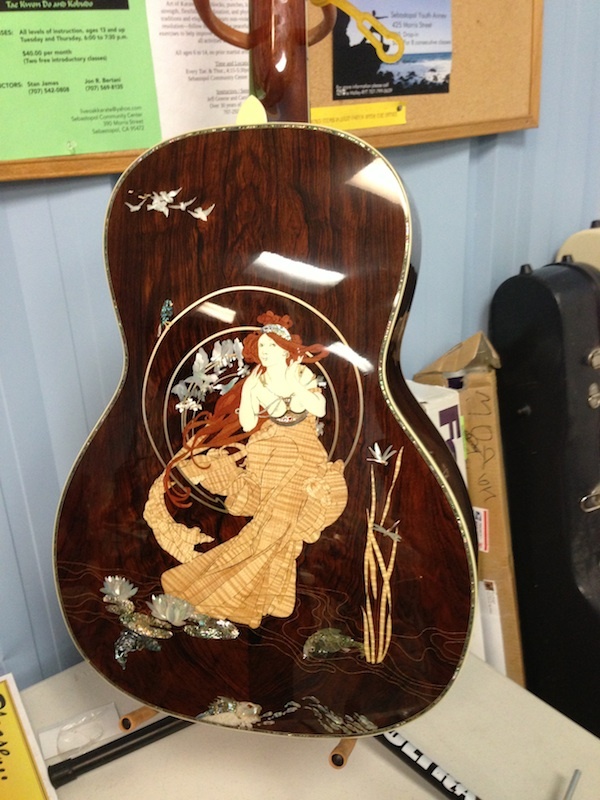 Woodworking is about passion and guitar making is a form of that passion. Woodworking is challenging enough but building a guitar requires making something out of wood that not only looks good but also sounds good. 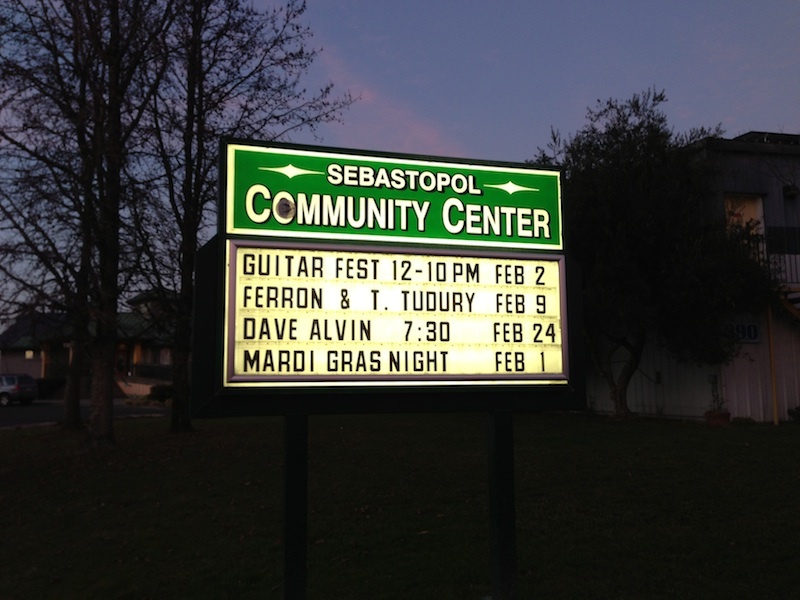 Kevin Russell is a musician and show promoter who lives in Seabastopol Calif. Kevin is so passionate about guitars that he decided to stage the first Sebastopol Guitar Festival. Two of my fellow band members from “The Bench Doggs” are none other than Tom Ribbecke who is an incredible arch top guitar maker and Larry Robinson, one of the finest inlay artisits in the country, so I had to go out there and check out the festival to see what my friends were up to. 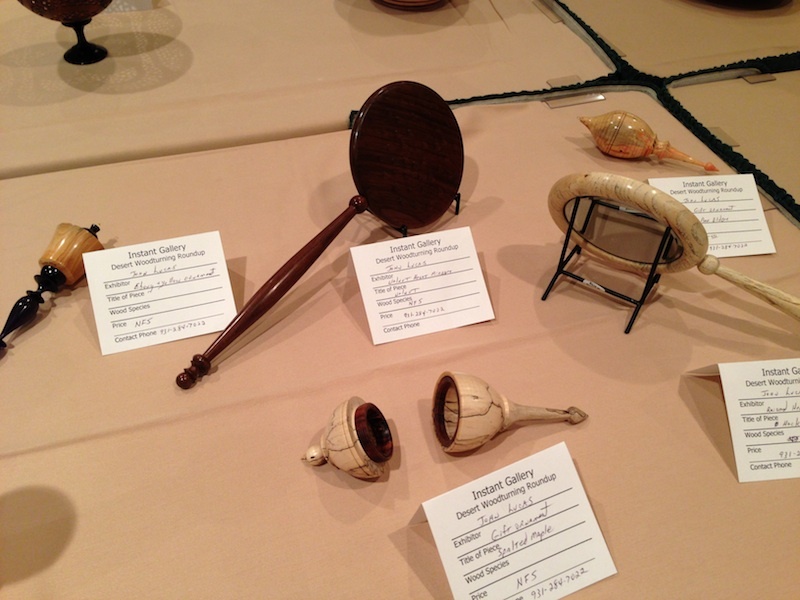 Larry had some of his instruments on display and I am always inspired everytime I see his work. 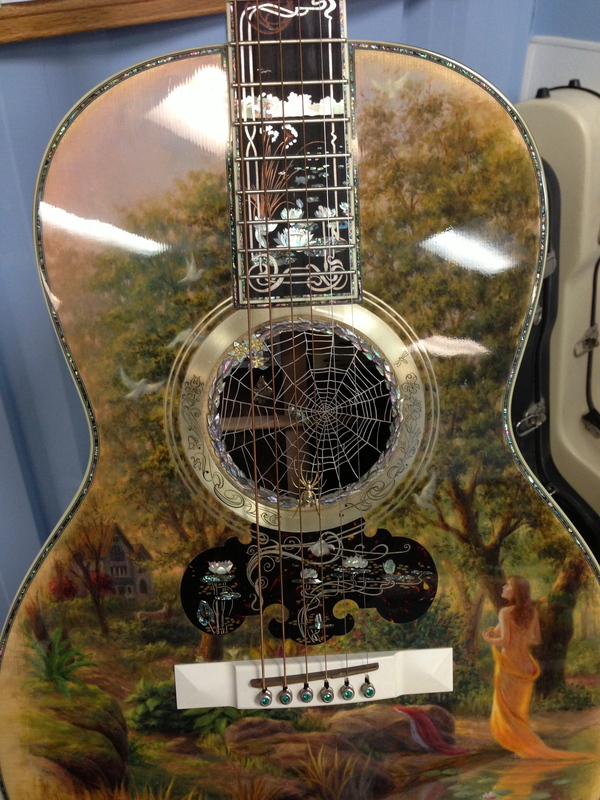 Take a look at the amazing detail work that Larry put into his “Nouveau Guitar”. 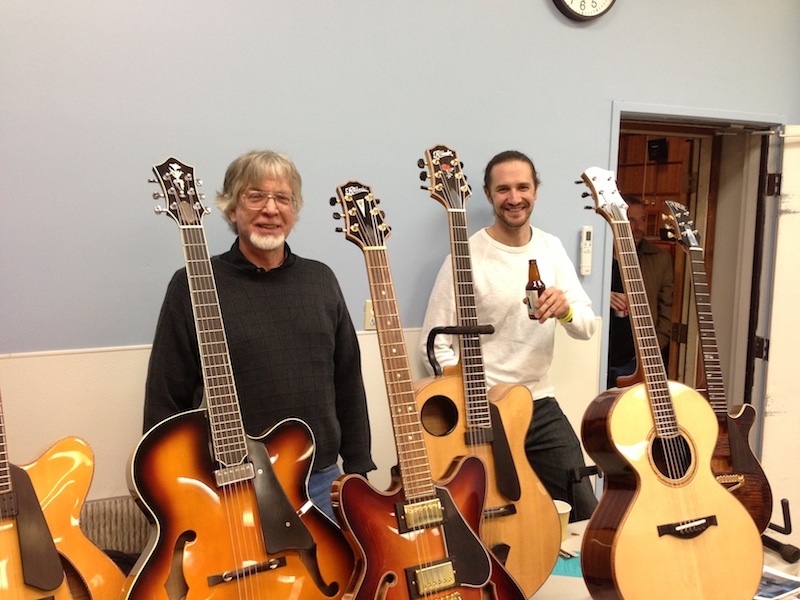 Tom Ribbbecke, Master Luthier, and his shop foreman Stuart Day were on hand to answer questions about the amazing qualities of the arch top guitars they build. 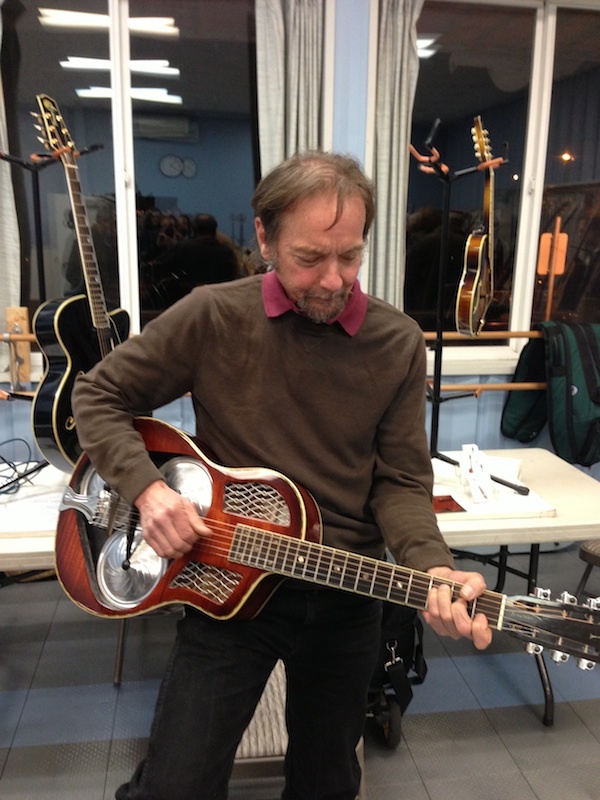 Tom has been designing and building guitars for over forty years. 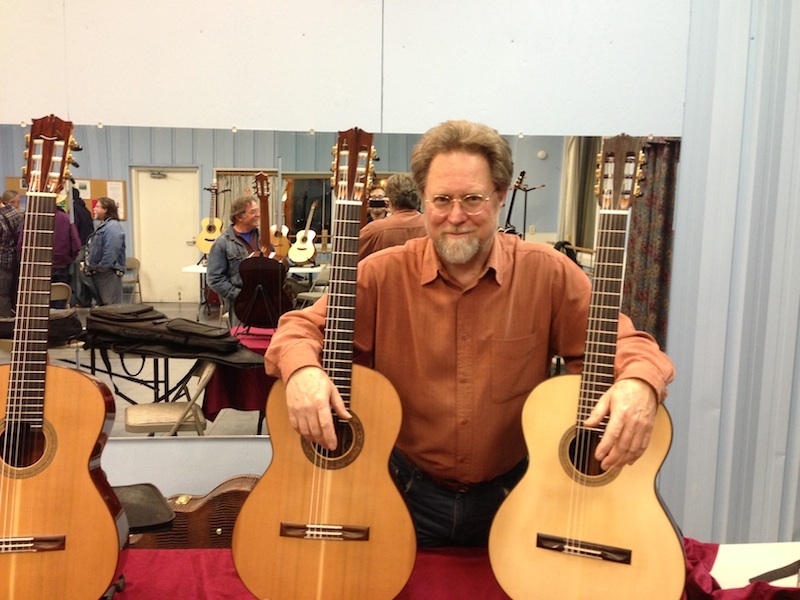 His craftsmanship and innate skills result in guitars best described as “extraordinary” and exceeding all expectations. My friends Richard Prenkert and John Knutson also had their guitars on display as well as many other great guitar makers. 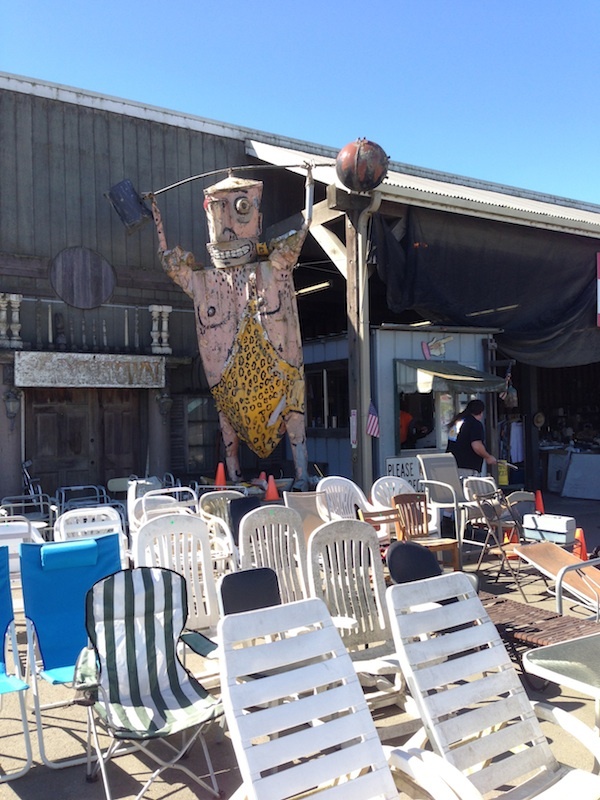 The Festival had a down home, relaxed feel to it. Guitar makers shared their creations with fellow makers, friends and guitar enthusiasts as well as others that were new to this genre and curious to see what is was all about. I was fortunate to be able to capture some of the sounds of the festival when I walked into one of the display rooms. John Knutson, and Bill Iberti were taking a break from exhibiting their work and found themselves playing some music with another musician. The wonderful melodies captured the attention of all that were within earshot. 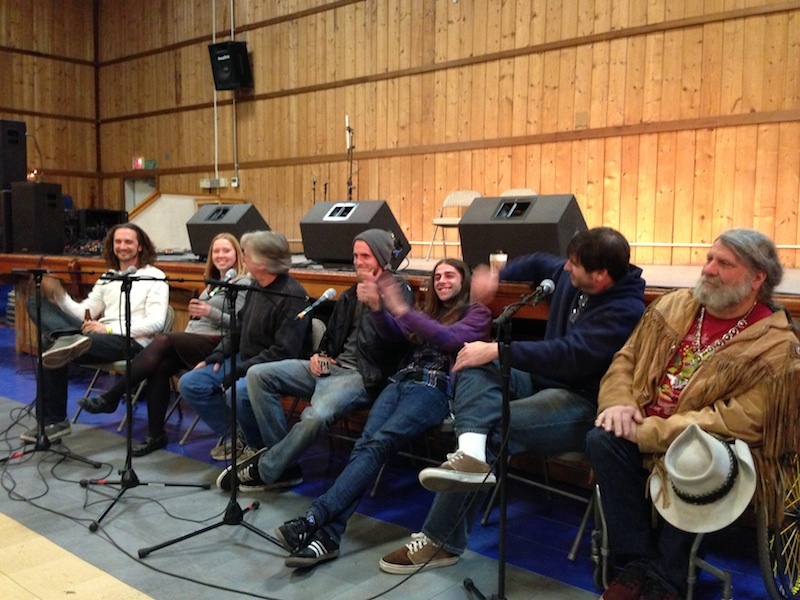 Tom was asked to lead a panel discussion about what it takes to earn a living as a guitar maker. 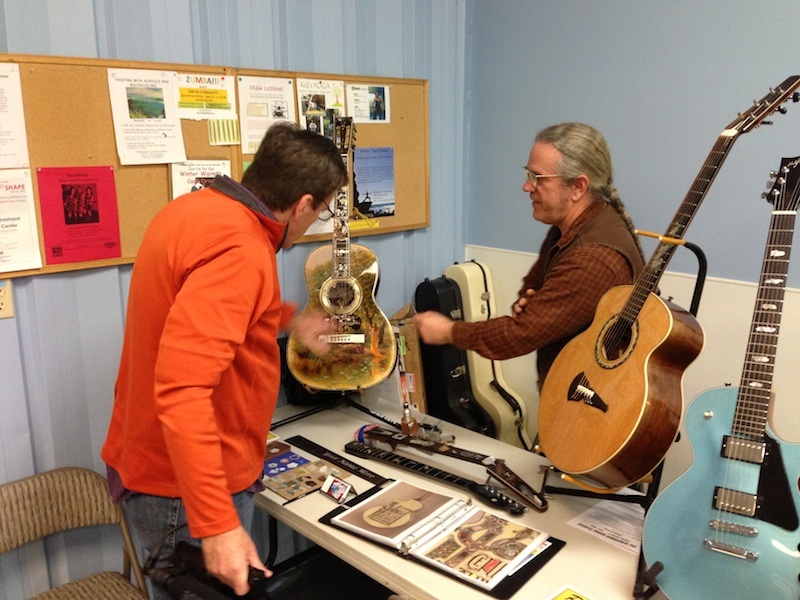 Some of the people that work with Tom were on hand to talk about their work as well as Robert Lee, another guitar maker who owns his own company. A great time was had by all. 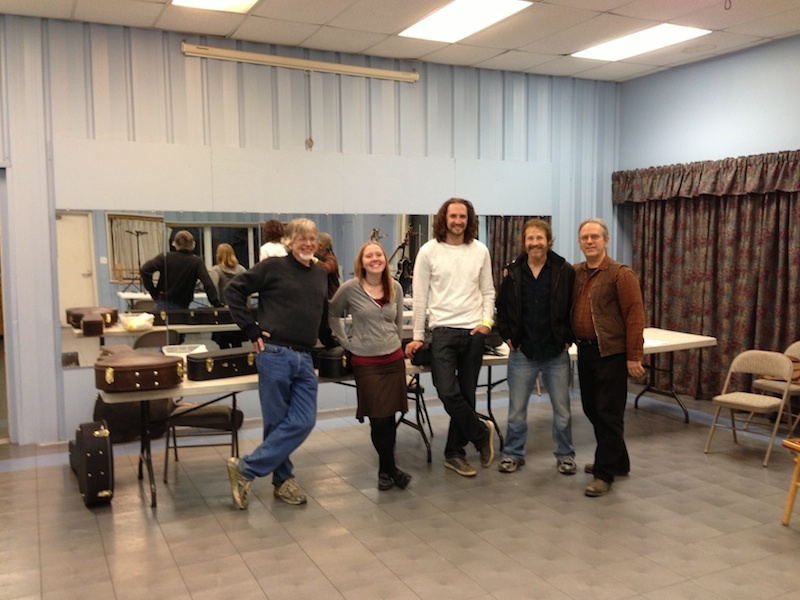 Tom, Maegen, Stuart, myself and Larry were captured in this photo at the end of the Festival. 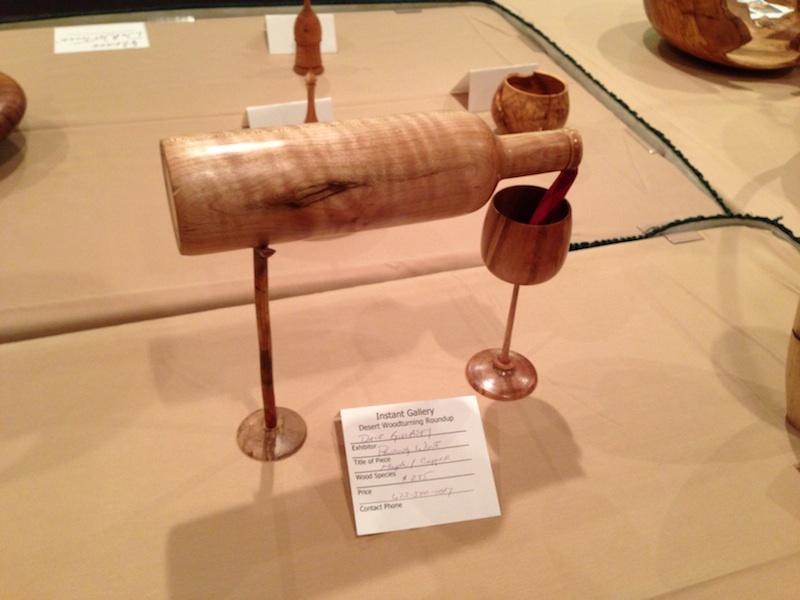 Phil Crane from the Sacramento area took a class with me early November 2012 on how to make a bentwood laminated lamp from mahogany similar to the one I made on Woodworks episode #512. Bending wood opens up a world of design possibilities that enable one to create things that have flowing curved lines as opposed to the predictable flat planed designs that woodworking is usually associated with. The process ironically begins with jointing the wood to create a flat surface. The first step is to create a flat surface. 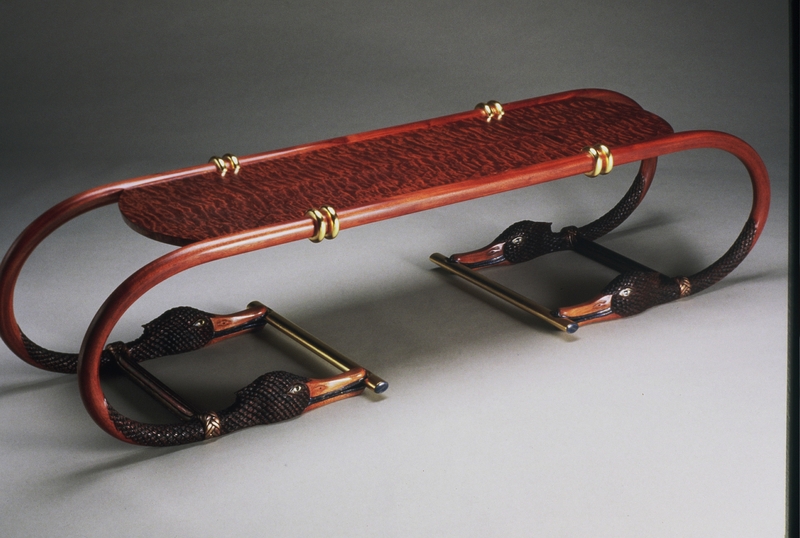 The next step is to resaw the wood into thin strips, the mahogany needed to 1/16″ thick in order to bend to a tight radius. 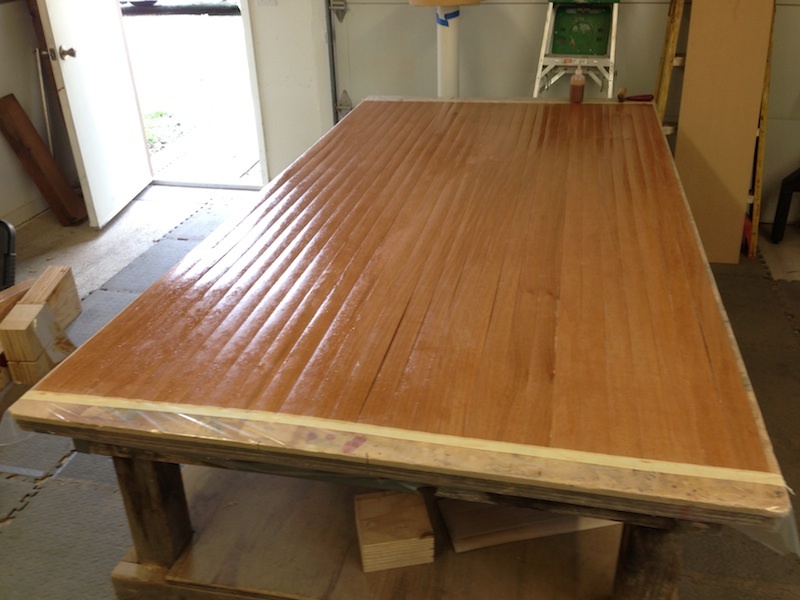 Laying out the strips on a table covered with plastic makes for a faster method of rolling on the glue. I prefer a slow setting Urea resin glue. The brand I am using is Unibond 800. Laminates are coated with urea resin glue. Here is Phil quite happy that we are ready to put the laminates in the bending form that I made on Woodworks. 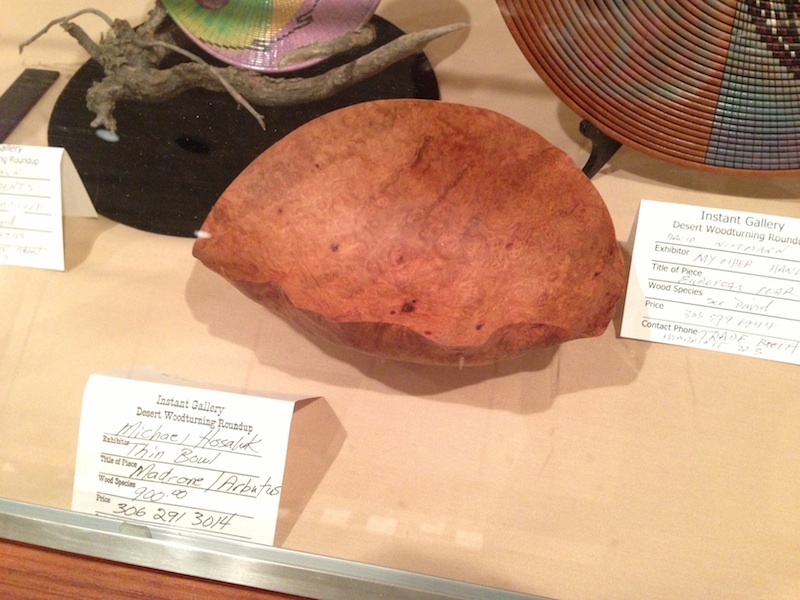 After the glue has dried overnight at 70 degrees, we unclamped it and the wood retains the shape of the form. The wood has now taken on the shape of the bending form. Our next challenge was to resaw the bentwood lamination in half which I did on my 36 inch bandsaw because of the wide curve. After that we routed a channel and glued in some 3/8th inch copper tubing for the wire. We used hot melt glue to hold the copper tubing in the channel. Once everything was glued up, we joined the legs to the trunk and Phil could begin sculpting and shaping the legs. 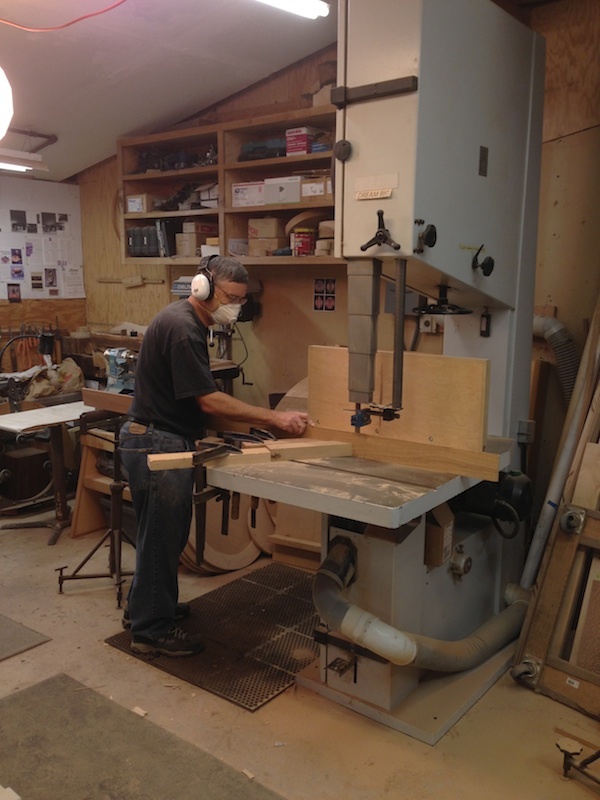 Phil is using a pattern maker’s rasp to smooth and blend the shape of the legs. After much work with a pattern makers rasp and lots of sanding, Phil’s lamp is ready for the finish which he will apply at home in his own shop. Phil’s completed lamp, ready for the finish. This is a photo of the original lamp that I designed and built for Woodworks made from Koa. This is the original Koa bentwood laminated lamp that I designed and built for WoodWorks episode 512. The lamp shade was a challenge for me. I finally decided to purchase one made from white Alabaster which seemed perfect for my design.